Wrapping paper that is shiny, or contains foil and metallic pieces, cannot be recycled due to the mix of materials. If you’re planning to recycle the wrapping paper, remember to remove all bows and ribbons because they cannot be recycled. Bows and ribbons can be thrown in the trash. Tissue paper is made out of recycled paper fibers that are too short to recycle. Find out what to do with tissue paper. You can recycle wrapping paper that has tape attached to it. It is a small contaminant that does not interfere with the recycling process. Instead of using paper made with virgin fibers, wrap your gifts in newspaper or brown paper with 100 percent recycled content. Wrap your gifts in newspaper instead of metallic wrapping paper. This reduces waste because you’re reusing the newspaper and not purchasing anything that’s non-recyclable. 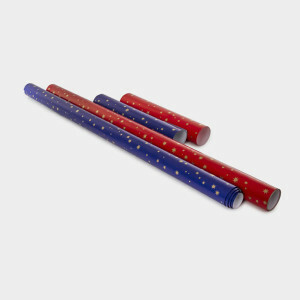 Wrapping paper in good condition can be folded neatly and stored for reuse at your next celebration or holiday.